We expect pups in the Spring of 2019. If you are interested in possibly adopting a new pup, please read the following section for more detailed information about our pups, health guarantees, visitation, and other policies. Our Cotons are all house dogs that are raised in our homes or our friends home. A great deal of time is spent with each pup to make sure it becomes very well socialized and used to human touch and smell. Our hope is that by the time the pups are ready to go home (to their new homes) that they will be well adjusted and ready to bond. We also are very careful to only breed dogs that have passed all health tests, and have really good temperaments, and beauty. We really love our Cotons and want to place them in loving homes. 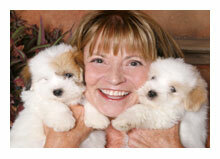 They are great companion buddy dogs that thrive on attention and companionship. We offer a 3 year health guarantee that covers serious hereditary or genetic problems (we can mail you a copy with the details), as well as a money back guarantee that you will receive your pup in a healthy condition. 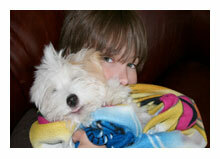 We also offer follow-up mentoring / assistance for the life of the dog. 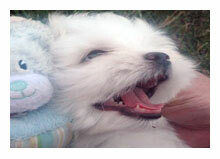 All pups are dewormed and come with appropriate vaccinations, vet records and vet checks. We also have a sales agreement covering our health guarantees, etc. that we will provide you. We know you will want and need pictures, videos, and progress reports on how your pup is doing until you pick it up. For this reason we will periodically provide pictures, updates, etc. on your pup, along with lots of information and links on puppy care. Also, we can sometimes send or email you pictures of previous litters from the same parents, so you can get an idea about how your puppy is likely to look and act as he/she grows up. We are very careful to only breed dogs that have passed health tests. All our foundation breeding dogs have passed Canine Eye Registry Foundation (CERF) eye tests, and Orthopedic Foundation of America (OFA) tests for heart, as well as routine vet checks, and vaccinations. Our health certificates are available for your review. If you are interested in getting a pup, please complete and email us the questionnaire found on the contact page of our website. We will promptly review it and contact you. To get on our waiting list to reserve a pup, we request a $300 deposit. Sometimes, litters are sold before pups are even born, so it is wise to send in your deposit as early as possible. Deposits are refundable until the pups are born. At the buyers request a deposit may be transferred to a future litter. 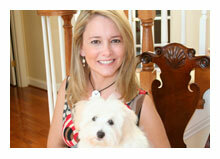 You and your family or friends are welcome to visit us to take a look at us and our dogs. We recommend it. Caution: Remember, a breeder that is reluctant to show you his dogs and their living conditions is probably a puppy mill. When you pick up your pup you will receive a "puppy pack", i.e. a bag full of goodies such as a puppy collar, leash, puppy toys, dog treats, potty pads, small bag of dog food, health and vaccination records, pictures, registration papers, and material on how to care for your new pup. It is important to purchase your pup from a reputable breeder like us. 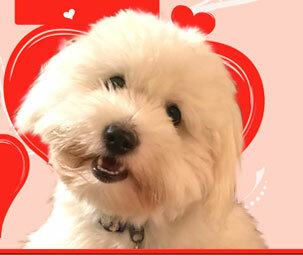 Otherwise, you may end up with a pup that is not a real Coton but a crossbreed with a fake pedigree. Keep in mind pups bought from inferior breeders such as puppy mills will often cost you more in the long run, as sad as it is to say, such dogs often develop health, genetic, hereditary, or socialization problems, that may add up to hefty vet bills. When you buy a Coton from Young at Heart Cotons it comes with a 3 year health guarantee, and our litters are either registered with the AKC, the UKC, or the National Coton Breed Club, the USACTC. Our dogs are health tested. If you are not familiar with what a puppy mill is click here, and/or www.prisonersofgreed.org. Caution: Even if the puppy mill breeder offers you a guaranteed "replacement pup", do you really want another inferior dog likely to develop the same health problems? We meet our puppy buyers in person (face to face) before or at the time of purchase, so we can answer all your questions, and you can see (in person) that your puppy is healthy, well-socialized, and a good match for you in terms of temperament. We do not sell any of our pups sight unseen. Beware of unscrupulous breeders who may ship you a sick or temperamentally unsound dog.